1. 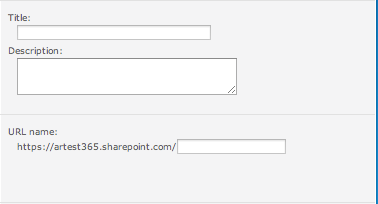 Log into SharePoint, click Site Actions, and then click Site Settings. 2. 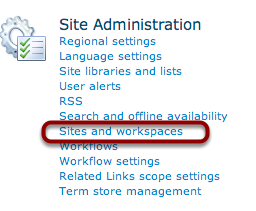 On the Settings page, under Site Administration, click Sites and workspaces. 3. On the Site Creation page, enter the name of the site, a description (optional), and the end part of the URL. 4. Next, choose a site template to use for the site. The description of each template is shown below the box (Team Site is the default and the one most commonly used). 5. Now choose the permissions for the site (this is one of the most important steps). This site can inherit the permissions of the main site or use unique permissions. Unique permissions will allow the administrator to give access only to users that need access (this can be changed later). 6. Finish the setup by choosing how to display the site on the Quick Launch Toolbar (left of site), top bar, and top link bar on other sites. Choose Yes for all. 8. If the same permissions of the parent site were chosen, the site will begin to be set up. 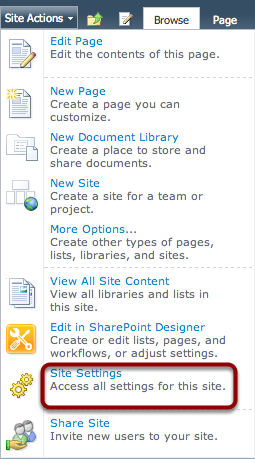 If Use unique permissions was chosen, a new page to set groups and permissions for the site will be displayed. The (Site Name) Members & Owners group will be set up. Then, select to use the default Visitors group from the parent or to create a unique Visitors group. It is typically best to create a new Visitors group. 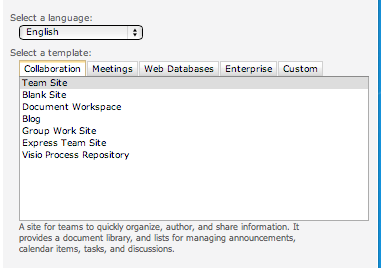 Click the Create a new group option button, then click the OK button. The new site will now be set up.